Cisco DPC2320 is a popular modem supplied by major cable Internet Service Providers. This tutorial explains how to manage this device and configure various features supported by it. It is actually a Wireless Residential Gateway which supports the features of both modem and WiFi router. So, if your Cable broadband service provider supplies DPC2320, you can share the broadband among multiple computers. The same tutorial can be used to configure and troubleshoot EPC2320 Euro DOCSIS Residential Gateway. It has one Ethernet port and WPS setup button. You can connect extra devices using the WiFi. By default DPC2320 log in IP address is 192.168.0.1 and there is no default password or username. 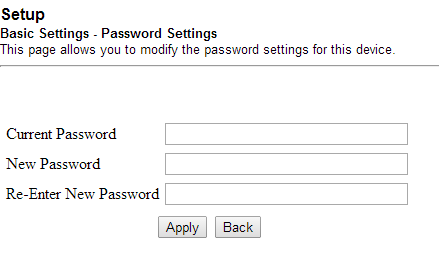 You can set up a password from the Password Settings under Basic Settings. If the time zone selected on DOCSIS Residential Gateway is wrong, you can correct it from 'Set Time' link under Setup. If the time zone is configured differently, Some cable ISP may prevent you from connecting to their server. 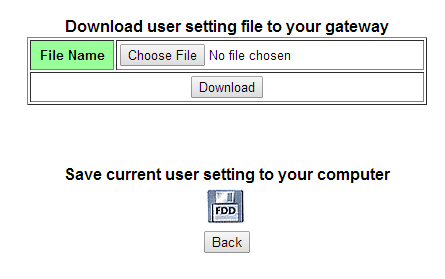 If you ever face such a situation with DOCSIS Residential Gateway, you can fix it from the 'Set Time' page. If you ever required to reset the device, you might lose every current modification you made. So it is recommended to take a backup of the current modem configuration. You can save current Cisco DPC2320 configuration by pressing the link 'Save Configuration to Your PC' under setup. Click on the Status tab on the top menu to view the current status of the device. To configure wireless and security on Cisco DPC2320, follow the steps below. Here you can set up the Wireless network name (Service Set Identifier) at SSID. You can also choose the right wireless channel for your network. Changing channel may help you to avoid noises. 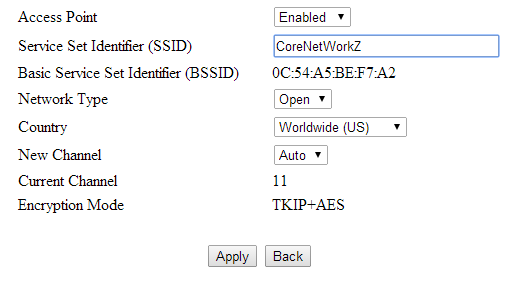 Here I have changed the default SSIS with the name of this blog CoreNetWorkZ.com and selected the channel as Auto. To configure WiFi security on Cisco DPC2320 Cable Modem, follow the steps below. Here change the device name and WPA Pre-Shared Key. If you have enabled WPA Pre-Shared Key, you must disable WEP. You can choose any one of the encryption standards from WEP, WPA-PSK, WPA-PSK2, and WPA. You don't need to worry if you forgot the password you set for Cisco EPC2320 Euro DOCSIS. 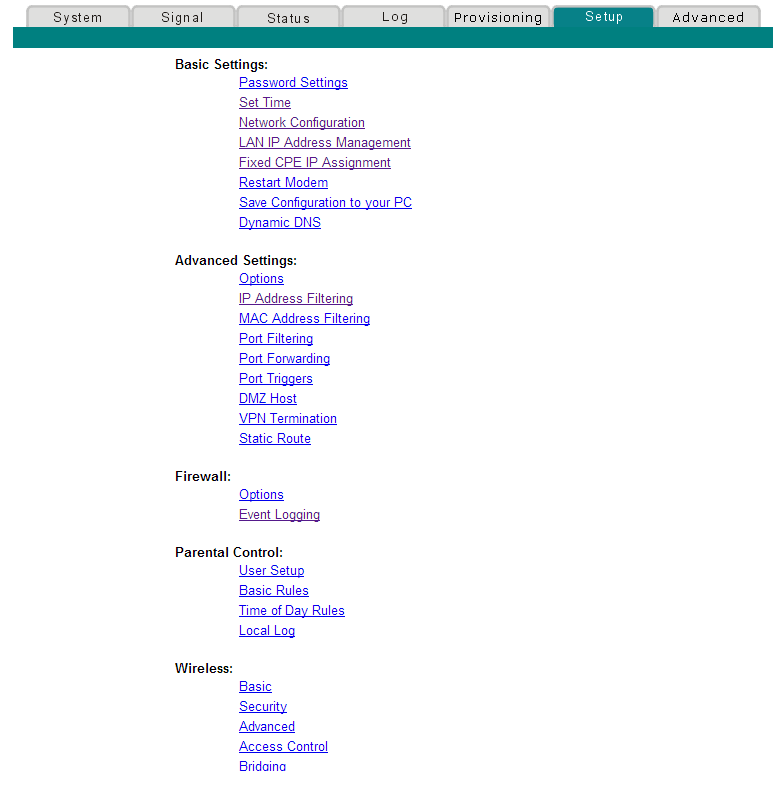 Log in to Cisco DPC2320 cable broadband modem using the IP address http://10.1.191.68/. One of the advantages of using this IP address is to bypass the modem login authentication. By typing the IP address 10.1.191.68 on the address bar, you will not be prompted to enter the username or password you have created. So we can say this IP address as the backdoor address to gain control of this model of Cisco Gateway. On Cisco DPC2320 you have the facility to block a computer or any device from connecting to the network. You can do it by using the features IP filtering and MAC filtering. 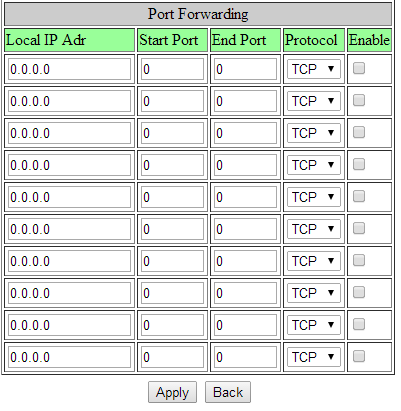 IP address filtering works only with devices having a static IP. If they refresh the current IP, most probably those devices will break this filter. MAC address filtering is more efficient because the MAC address is inbuilt address. However, there are so many MAC spoofing services which allow users to change the MAC address of their devices. Now let us check how to enable these two filters. 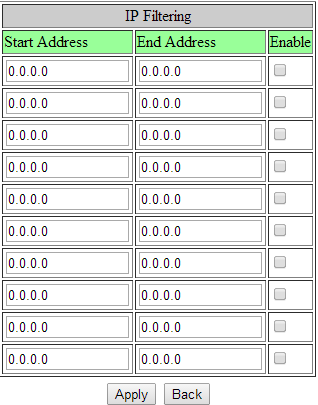 Click on 'IP Address Filtering' under advanced setup to block a particular IP from joining the WiFi. You can simply add the IP you want to block and click Apply. Click on 'MAC Address Filtering' under Advanced Setup. Here you can either white-list or blacklist MAC id. 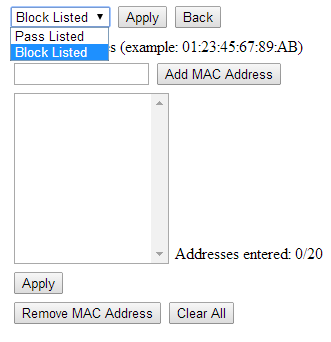 If you select block listed, all MAC id listed here will be blocked from joining the network. If you select Pass Listed, all MAC id entered here are the only devices who can join the network. No devices without specifying their MAC in this filed will not join the network. Here you can see the basic information about this device. To check the system details, you may look at the chart shown on this page. Here are the details I fetch from this page about this device. Cisco DPC2320 (EPC2320 Euro DOCSIS Residential Gateway) has a special feature which allows us to check the connected devices. Under status bar, you can see the list of devices connected to the network with their MAC and IP. You can see the computers connected to this gateway and sharing your Internet under CPE Connections. Right now two computers are connected to the network and you can see them here. Since Cisco DPC2320 is a residential gateway, it has inbuilt firewall protection. Cisco DPC2320 may prevent the working of online applications like Online games because those applications use ports which are by default blocked by a firewall. If you face troubles with playing online games through this gateway, you might need to perform port forwarding. How to disable SSID on this modem? I think that FreeNegative was refering to "How to stop the SSID Broadcast?" because i found the same issue here and I still can't figure it out. By disabling the Wireless Access Point on Cisco DPC2320 Cable Modem, you are actually disabling the wireless broadcast. If you disable SSID broadcast, your modem still broadcast wireless but others will not see the name of the wireless network. This option must be in advance wireless settings. How do I enable these tabs: Signal, Status, Log, and Provisioning? Also, why can't I view the Advanced tab after Setup? Why are these tabs disabled: Signal, Status, Log, and Provisioning? Also, why the Advanced Tab is not available? i forgot to take the backup of configuration before reseting it. what should i do now? Cisco DPC2320 does not provide any other option to get back the previous configuration once it is reset. Can you provide more details about which button you pressed ? What all you did on the device that prevented you from login and use Internet ? PS: Reset is an option to erase every changes you have made on Cisco DPC2320 Cable Modem. To reset Cisco DPC2320 Cable Modem, follow the instructions given in the link below. http://10.1.191.68/ doesn't work.. it said the site can't be reached. Reconfiguring my Cisco, was Googling settings and ended up here. Anyway, to change the SSID broadcast to that it just comes up as "Hidden Network," under Network Type, choose "Closed" from the dropdown. How to limit other user bandwidth? I could not find settings to set bandwidth allocation for each user in this model.